Members in Brazil, DC Logistics have received 6 awards at the 2017 Infraero's Logistics Efficiency Awards 2017 held the Centro de Eventos da Federação das Indústrias in the State of Paraná. 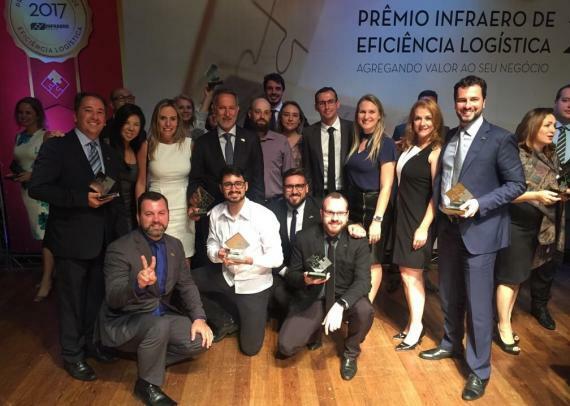 Managing Director, Guilherme Mafra: "The evening of November 29th gave recognition for DC Logistics Brasil! These 6 awards mean we now have a total of 20 trophies in our history from the Infraero Awards which is very respected in the logistics sector. The awards consolidate the performance of DC Logistics in different types of cargo and business sectors and the recognition of the tireless work of our team, that always strives for excellence, serves as a motivation to continue in the quest to always make it better." To become winners, Infraero defines the companies that use the transportation services the most and these companies indicate the cargo agencies. Among the criteria required are clearance time of cargo, transport within standards, efficient operations and applied logistics. "The timing of the logistics process is monitored and ranked from the arrival of the cargo at the Infraero terminals until delivery to the importer or its legal representative." explains Guilherme. With ten offices in the country, DC Logistics Brasil has been working at innovative and optimised logistics solutions for 23 years. They offer agility and local experience for both national and international logistics. 2017: Won as Freight Forwarder for Special Customs Operations for the commodity Electronics. 2016: Featured Freight Forwarder and the winner in the Textile, Metal/Mechanical, Chemicals and Equipment & Instruments Medical/Pharmaceutical segments. 2015: Featured Freight Forwarder and won in the categories; Textile, Metal/Mechanical, Equipment & Instruments Medical/Pharmaceutical and Diverse Goods. 2014: Awarded in the Equipment & Instruments Medical/Pharmaceutical segment.